It is rare to find a refuge in a place that has been mostly taken over by humans. 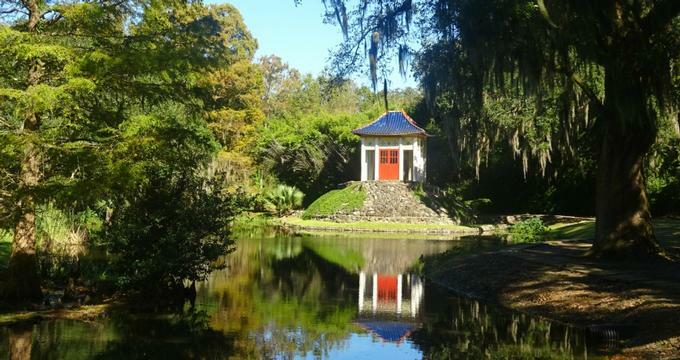 Jungle Gardens, otherwise known as Avery Island is that place - a place visitors can go to immerse themselves in nature and enjoy how beautiful and important conservation of that world is. Dreamed up by Edward Avery (E.A.) McIlhenny (better known to friends as Mr. Ned), who was born on Avery Island, Jungle Gardens has always been a place to celebrate conservation. Born the son of the man who invented Tabasco sauce, Mr. Ned turned what was once a private space into a public area to help draw attention to his causes, opening it in 1935. It now spans 170 acres. There are many nature areas and trails to explore, as well as attractions that guests should make sure not to miss while on the premises. Make sure to take the mobile phone tour, which will guide visitors and make sure that nothing important gets missed or overlooked! Tours are offered in both English and French. Monsurat - Avery Island has it fair share of ponds and water dwelling creatures, including alligators. However, one of the largest alligators to live on the grounds was one nicknamed Monsurat (either a take on the Louisiana French vocabulary word for monster or a Catalan word for jagged mountain which would have described his back) by McIlhenny. Coming in at around eighteen feet in length, this gator is now preserved for all to see. View the birds - Founded in the 1890s after being concerned about the number of egrets that were being killed by hunters, Mr. Ned started this bird sanctuary to protect them and found that they would continue to return year after year. At one point, it was said that over a hundred thousand different birds used Bird City as home! Guided bird tours are offered, with a downloadable list of bird available on the website so that visitors can check them off as they see them. Buddha - This 900-year-old statue of Buddha was a gift to the founder of Jungle Gardens from some friends who knew that he had an abundance of Asian plants in his collection. The statue now has a prominent place in the garden and also serves as a local meeting and meditation point for Buddhists in the area. Local wildlife - Besides the alligators in the ponds, the area also is home to many other species of local wildlife like coyotes, muskrats, armadillos, wild cats, and others. Although not all of them still inhabit the area, it has been at least a stopping place for many different animals over the years. Bamboo - One of the oldest living groves of bamboo in the United States is located here, featuring over sixty different varieties of timber bamboo. Field trips are offered daily at a small cost to students and free for teachers and chaperones. It is recommended to have at least one adult per every thirty students and there is no limit on how many of students may attend at a time, as long as prior reservations are made. Teachers should plan on around an hour and a half to tour the grounds fully. Jungle Gardens is disability accessible and appropriate for grades 1st through 12th. Lunch is available on site, although students are also welcoming to bring sack lunches and eat at one of the picnic areas. Teachers can also purchase sack lunches on the grounds as well. There are a variety of approaches to take to planning the field trip, as there are industrial, archaeological, and nature based tours. Depending on what each class is studying, the website offers guidelines on what benchmark is useable for each grade level. One of the newer events at Jungle Gardens is the Taste of Christmas, which is a children’s event and festival meant for the whole family to enjoy! Visit with Santa, decorate cookies with Mrs. Claus, drink hot chocolate, ride the trolley… expect nothing but Christmas fun at the Taste of Christmas! Another special event held on the grounds is the St. Jude benefit runs - a one mile, 5K and 7K run. Held in November, the money raised goes to benefit St. Jude and all that they do to help cure and treat children’s cancer. Weddings are also allowed at Jungle Gardens, with a down payment and a reservation of at least two months in advance. Any area is available as long as it is reserved with gift shop employees. Clean up must be handled by the wedding party or an extra fee will be charged. Receptions must be held off site.